Many people has asked the Customer Services if the social share only support email and on Facebook, how about other medium? If I do not have a Facebook account I cannot do the social share for the flipbook? 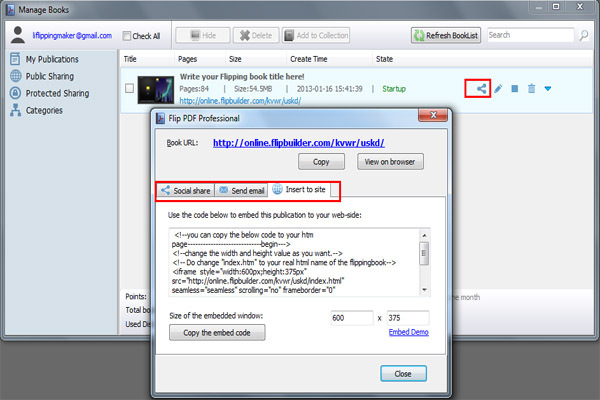 For an International accepted flipping page book converter, the A-PDF FlipBook Maker does not only support the individualization in toolbar language, but also the social share. And then you can upload the flipbook to A-PDF server and get different way to share your flipbook. For example, copy book link to others, email share flipbook or embed code to your own blog or website. Certainly, you can publish the HTML version flipping page book to PC and FTP all files to your website. Only after uploading the flipbook, can readers or viewers use the social share feature.